New videos pop to the top of the Water Rocks! charts enabling audiences to learn about conservation while having fun! Water Rocks! has released a series of new rap music videos created to engage audiences with music and messages about conservation topics ranging from soil health (“Royal Soil”) to understanding watersheds (“Watershed Rap”). The videos are available to view and enjoy on www.waterrocks.org. Through classroom visits and school assembly programs, Water Rocks! uses a combination of science, music, games, audience interaction, and videos to deliver information, engage with students, and teach the upcoming generation about the importance of our natural resources and ways to improve the environment. Topics include biodiversity, land management, water quality, the importance of pollinators, and things every person can do to contribute to a cleaner and more sustainable ecosystem. The rap video series includes “Royal Soil,” “Wetlands,” “Watershed Rap,” “Monarch Milkweed Magic,” “Biodiversity Rap,” and “When We Waste Food.” These six new clips join some eighty-plus Water Rocks! video selections available on www.waterrocks.org. Video content from Water Rocks! ranges from short animation clips to full-length documentaries, offering science-based education for audiences ranging from kindergarten students to adults. Iowa City videographer Andrew Bentler directed and edited the rap series. Bentler has worked on national television programs such as Z Nation and Mountain Men. The songs featured in the videos are also performed live during Water Rocks! assemblies at schools across Iowa. Water Rocks! Assemblies are Rockin’! What do singing, dancing, dog poop, water quality, full audience participation, and a big blue Snuggie all have in common? You’ll get all of these things and more with the brand new Water Rocks! Assemblies! This fall Water Rocks! rolled out a creative and exciting endeavor called Water Rocks! Assemblies, using music to teach the science of water quality for kindergartners through 8th grade across the state. The mission of Water Rocks! Assemblies is to educate, challenge, and inspire young people towards a greater appreciation of our water resources. Water Rocks! continues to reach students through its popular interactive classroom visits, but the Water Rocks! Assemblies are unique in that multiple classes, even multiple grades, with hundreds of students, can be reached at one time! Since Water Rocks! took their new show on the road in September, thousands of students across Iowa, along with their teachers, have rocked out with Water Rocks! Assemblies. During the Assemblies, students learn about watersheds, natural resources, conservation, and land use. The teaching is done through music, dance, theater, games, and interactive lessons. This innovative approach of infusing science and music makes learning fun, and helps students commit valuable information to memory. The Assemblies encourage students to participate by singing, dancing, performing in a play, and answering questions. Catchy Water Rocks! songs like “We all Live in a Watershed,” “What’s in Your Water?,” “Scoop That Poop” and “The Watershed Rap” bring students and teachers to their feet to sing and dance. Teachers are happy to see their students have such a great time while learning. Students in 4th-8th grades are entertained by an activity called “Watershed Broadway.” Peer helpers from the school perform in a play that illustrates how various pollutants move from our land to waterways in the Mississippi River Watershed, eventually making their way to the Gulf of Mexico. A Water Rocks! team member donning a big blue Snuggie plays the part of a raindrop who has just fallen out of the sky, and has to travel to the river. Along the way the raindrop meets some friends who join her on the journey to the river. These friends are pollutants such as garbage, sediment, fertilizer, pesticide, oil, and dog poop. Their journey to the river culminates with a cannonball into the river, in which the audience gets to see how pollution affects our waterways. Students in kindergarten – 3rd grades learn about harmful water pollutants by playing a gameshow-style game called “Clean River, Dirty River.” In the game, students are selected from the audience to come to the front. They are each given a picture of an item that can be found in a clean river or a dirty river. One at a time, they are asked to place their item on either the “Clean River” poster or the “Dirty River” poster. It serves as a great visual for younger students to see how pollution impacts our rivers! Peer helpers are an integral part of the assemblies. Peer helpers are students identified as leaders by the faculty and staff at the school. The helpers sing, dance, and perform alongside Water Rocks! staff. They also encourage the audience to participate in the songs and activities. If possible, high school students are used as peer helpers, which is always a big hit with younger students. The Assemblies were created keeping Next Generation Science Standards in mind, so that teachers can coordinate classroom lessons with the information presented in the assembly. After each Assembly, teachers are given a packet of follow-up resources that contain workbooks, enhanced learning activities, DVDs, CDs with award-winning Water Rocks! music, and more. Would you like to bring a Water Rocks! Assembly to your local school? Sponsorship opportunities are available — this is a particularly unique opportunity for Soil and Water Conservation Districts, local businesses, and individuals to show your support for conservation and natural resources education! Water quality matters to us all! Contact Jacqueline Comito at 515-296-0081 or jcomito@iastate.edu to discuss sponsorship to reserve a School Assembly in your local district. Spots are filing quickly for spring, so act today! With some of the richest, most fertile soil in the world, we certainly have a lot to celebrate here in Iowa! In honor of the World Soil Day celebration, we have two new videos to share with you today, highlighting the critical importance of our soil resources. We’ve got all ages covered – there’s something for everyone! Created by Megan Koppenhafer as part of a summer student internship project, Interesting Things Underground celebrates in song the amazing diversity of living creatures right under our feet! The peppy tune was written by our friend Marty Adkins with the NRCS. This music video is great for preschool and elementary-aged students, helping them to see the “millions and billions and trillions and zillions” of unique living creatures in the soil ecosystem. Further, we also have enhanced learning activities + worksheets for Grades K-2 and 3-5 to accompany this video! For the middle school, high school, and adult audiences, we are thrilled to share with you a little sneak peek preview of our brand new music video called Keep That Soil Alive! Dedicated to women who care for the land, this video explores our legacy and connection with the land, landowner-tenant relationships, and the many different conservation practices that help our soil stay alive and thrive — all woven together with a Johnny Cash-inspired tune. Enjoy the short trailer, and stay tuned for the full video release in early 2017! Our last video spotlight is NOT a new release, but still one of our favorites – Slow Jam Soil Erosion with the one and only Rick Cruse, aka Poor Rick/Dr. Soil. Our soil here in Iowa is an incredible resource, but we’re losing that soil more quickly than it can be replenished through the process of erosion. Let’s give our soil a shout out today on this day of celebration for World Soil Day! December 5, 2016 astaudt	education, Iowa, Iowa Learning Farms, Iowa State University, music, music video, natural resources, outreach, soil, soils, video, Water Rocks! This is our our final intern guest blog post for the summer! Noah Stevens is entering his senior year at Ames High School, where he is actively involved in track, cross country, and the performing arts. He has helped out with numerous Water Rocks! video productions over the years, and this summer participated in our high school internship program. I’ve been involved with the Water Rocks! program since its origin back in 2012, and I must say, it has been fun to watch it progress in its success. From watching myself in the first Water Rocks! music video on the Water Rocks! website to being present at the Capitol building when the program was awarded with the Iowa Environmental Excellence Award for the State of Iowa, I have felt very privileged to be a part of this organization. To be honest, though, I had no idea that Water Rocks! has had such a big impact in the world of education until my internship this year. When I think about it, I realize that all the recognition and awards the program has received are definitely well deserved. I remember the day in my freshmen year of high school when Mrs. T [DeAnna Tibben, Earth and Space Science teacher at Ames High] told my science class that we were going to spend the entire class period exploring the Water Rocks! website. I was completely surprised! To me, the website was just a bunch of pictures and videos of me with my friends and family doing things to help the environment, but not to the rest of the class. To them, the website was a river of new information about water quality, conservation, and fun. Yeah sure, I recall my peers joking around with me because they saw me in the videos and pictures, but I also recall them talking to each other and asking questions about water. That was a really cool thing to see the program that I was involved with be taught in my classroom and be widely accepted by high school students and teachers alike. Noah’s film debut in the Conservation Dogs music video (2012)! Apart from my internship, my experience with Water Rocks! has been primarily through the music videos and songs produced by the program. With that said, my internship with Water Rocks! has shed a new light on how much educational material the organization actually has! Alongside dozens of informational videos and songs, Water Rocks! has loads of classroom modules, presentations, and games that inform about all things water. What is taught does a great job at not confusing the learner while at the same time informing effectively. The best part is that these materials do not just teach the information presented, they engage the learner and encourage them to participate in the learning; and it is fun! A few more recent music videos that Noah’s been a big part of: This Is Our Time (top) and Soil Health Style (bottom). Besides all of the material Water Rocks! is able to teach people, something I really noticed about the program is how much, and far, the Water Rocks! team travels across the state to present the information. From county fairs to farmer’s markets, the team sent people all across the state throughout the whole summer presenting the Water Rocks! material. I was genuinely surprised at how many people were interested in what we had to say. In addition to video production, Noah got a taste of outreach this summer traveling to events across the state with the Conservation Station! Here he is with college interns Kate Sanocki and Hannah Corey. All in all, Water Rocks! is a great program full of information, engagement, and fun! It has been an interesting ride to see the full story behind what all goes on in this great organization in addition to the music. NOTE: You’ve been meeting our great group of college interns through their guest blog posts these past couple weeks, but it’s time now that we show some love to our outstanding high school interns, as well! Kicking things off is Jessica Rehmann, a 2016 Ames High School graduate who is back for her second year in the high school water resources internship program. My name is Jessica Rehmann, and I have come back to intern with Water Rocks! 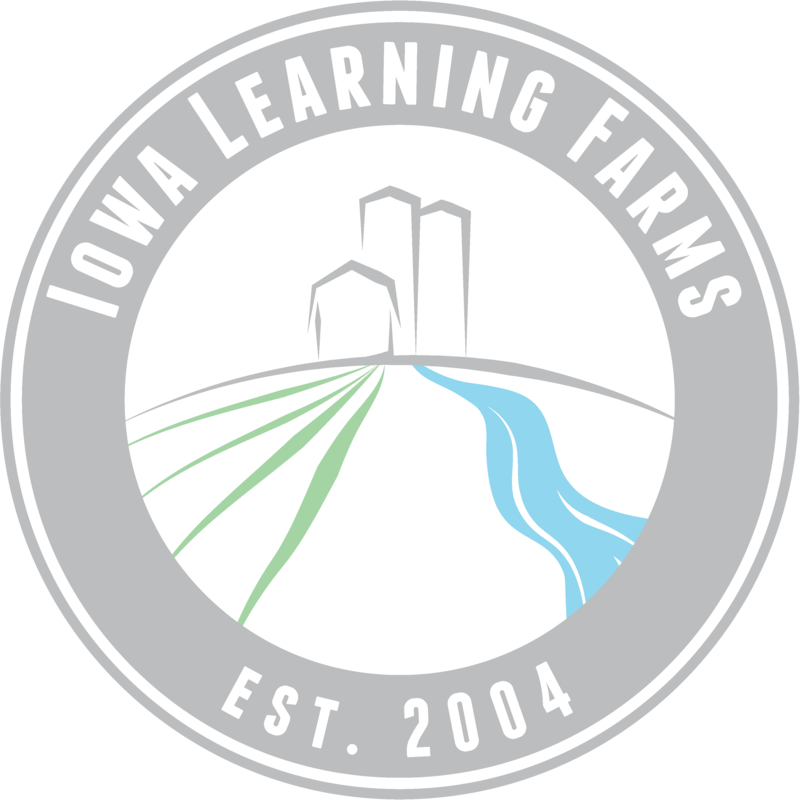 and Iowa Learning Farms for a second year. I just graduated from Ames High School, and I will be a freshman at Washington University in St. Louis in the fall. Last year, I enjoyed my experience with the internship, and I appreciated the variety of tasks, including field research and outreach. I learned a lot about conservation practices and farming methods, and I saw them in use when I worked in the fields collecting data for research. At outreach events, I learned how to effectively communicate field research results and conservation practices to the public. Because I have grown up in a suburban environment, I had little prior knowledge of anything related to farming before the internship. Now I can have educated discussions on conservation practices. I decided to do the internship again this year because I wanted to continue working on research projects from last year, doing more outreach with the community, and learning more about conservation and sustainable farming practices. As I did last year, I have counted earthworm middens in the fields. This year the counting was easier and faster because I knew better what I was looking for in each plot! Counting earthworm middens in cover crop strips at the ISU Boyd Farm earlier in June. I have also collected water samples from lysimeters in the field. The last time I went, the field had just had a large rainfall, so the lysimeters were very full. I am excited to learn how to analyze data from the lysimeters. Tools of the trade for collecting water samples from the suction lysimeters. The internship has also involved two of the extracurricular activities I enjoy the most: music and art. Last year, one of my favorite parts of the internship was getting to play saxophone in the recording studio for two of the tracks on the new children’s music CD Trees, Bees, and More Nature Songs for Water Rocks! I liked the opportunity to tie my work and music together. I also saw how an analog recording studio works, which was a neat experience. Recording at Junior’s Motel Recording Studio, near Otho, last year. This year, I have a new creative side to the internship: I am helping to redesign the website for the Conservation Pack and helping to write an interactive “Letters to the Conservation Pack” activity for kids. I am also excited for the fair season to reach full swing! My first event was recently working in the Keosauqua Farmers Market, and in the upcoming weeks, I will attend more county fairs. Leading the hands-on Enviroscape activity (aka Watershed Game) at the Dallas Co. Fair last summer (TOP) and the Keosauqua Farmers Market this year (BOTTOM). My experiences with this internship and my love of hiking and the outdoors have made me want to study environmental science in college. In the fall I will be taking a class on Missouri’s natural heritage, which will cover environmental science and more. Because sustainable practices are important and relevant–especially in the Midwest–I am interested in their technical foundations and the social and political aspects of implementing them. I am excited to see where the rest of the internship this summer will take me!